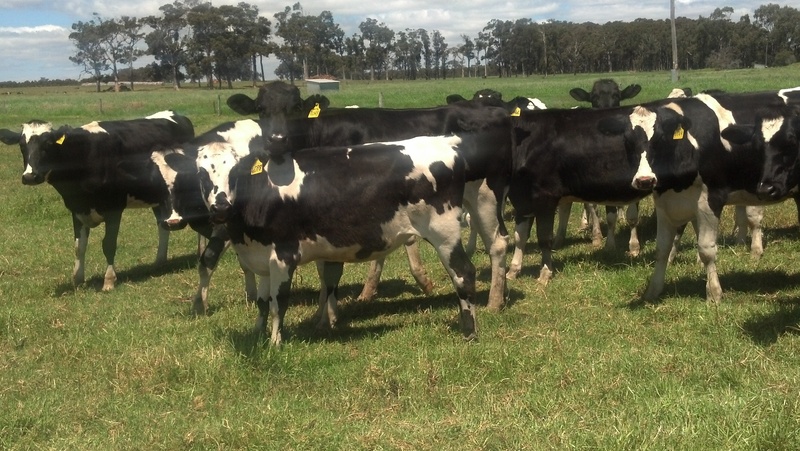 The guide is based on a comprehensive study of energy requirements on dairy farms in North-East Victoria, conducted by Genesis Now with assistance from Graham Redding and Associates, for the Upper Murray Development Board (with the support of Business Victoria). We also have an information page on electricity supply voltage which is particularly relevant to rural areas. 40% of the dairies surveyed were buying electricity under tariff “B-Farm Supply”. These would reduce their electricity costs an average of 30% ($2090) by transferring to tariff “D”. (These are Victorian tariffs. In other states, please check the most appropriate tariff with your electricity supplier). Clearly, tasks which can be shifted conveniently to the off-peak period should be, as the electricity cost will be reduced by 50%. completing milking before 7 a.m. EST will significantly reduce total electricity costs. Comparing your energy consumption with similar dairies will give an indication of the potential to reduce costs by reducing energy consumption, without compromising on convenience or the quality of energy services. If the small dairy with the highest electricity consumption per cow could improve its energy efficiency to that of the small dairy with the lowest consumption, it would achieve an 80% reduction in consumption. In most dairies, electricity is the only energy used. 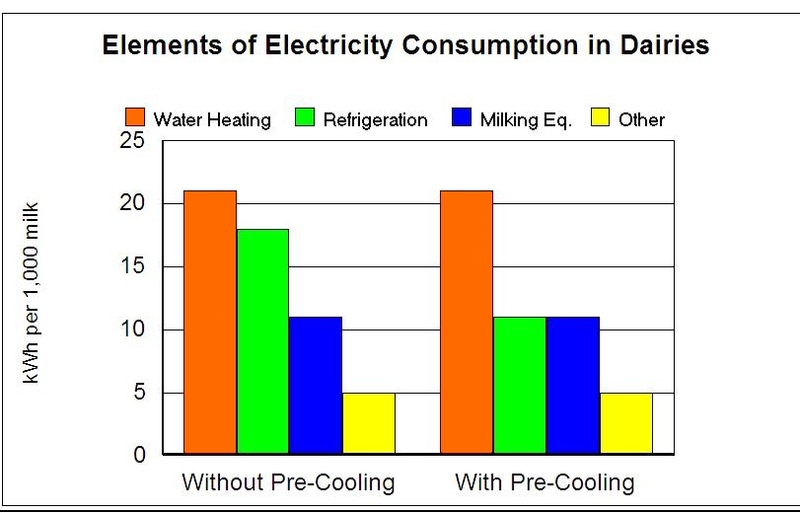 Water heating accounts for about 40% of the electricity used in dairy farms, but only about 25-30% of dairy electricity cost (because of the use of cheaper off-peak electricity). Ensure that the thermostat is not set too high and causing the water to boil water boiling in the cylinder (producing steam uses 10 times as much energy as heating it from cold to 95° C and the water is lost from the system). The water heaters are not designed for boiling water, and so boiling should be prevented for safety reasons as well as cost efficiency. The heat removed from milk is a renewable source of energy. It is also a heat source which is well matched to the demand for heat, ie when the dairy is being used, the heat from milk is available. The heat removed from the milk from 200 cows in one day is about 163 kWh or enough energy to heat over 1500 litres of water from 15° C to 95° C (over double the amount required). A de-superheater which can be fitted to refrigeration equipment is capable of heating water to 70° C, and so some boosting is required to reach the required end-use temperature of 80° C.
Heat can also be recovered from the milk pre-cooler heat-exchanger. The achievable water temperature will be much lower (around 30° C, depending on milk and water flow rates). This tempered water can be used for udder washing or as feed water to the main heater or de-superheater. De-superheaters cost around $500 plus installation, but are normally supplied as a component of a complete water heating system. An energy efficient water heating system with de-superheater, tanks and controls costs about $4000 compared with about $2000 for a standard system of similar capacity. LPG can be used to heat water to the temperatures required in dairies. It is well suited to boosting the temperature of water which has been preheated by heat recovered from the milk. LPG water heaters can heat water at the same rate that it is consumed, and so there is no need to store hot water. This reduces heat losses are reduced, and allows for more precise control of water temperature. An instantaneous LPG water heater is used to heat water as the water is required for use. This will reduce the heat losses to a minimum and so compensate for LPG’s higher cost. LPG-fired water heating will also emit 83% less CO2 (the major greenhouse gas) than electric water heating. Cooling water temperatures and hence refrigeration energy can be minimised by using a commercially available, cooling tower. These are used in air-conditioning systems, and are designed to maximise the cooling effect, by using “fill material” which is maximises the surface area of contact between air and water. Maximising milk pre-cooling will minimise the time that the mechanical refrigeration system takes to cool milk in the vat to the temperature required, and so will minimise the growth of micro-organisms. LED lighting will provide the most cost-effective lighting solution in most dairies, especially if the roof is lower than 5 metres. These will reduce the power required to achieve the 240 lux lighting level recommended in dairy sheds. Replacing incandescent lights in homes with low cost, high efficiency, LED lamps with warm light colour appropriate to residences will reduce electricity costs and, reduce the inconvenience of frequent lamp failures. Some farms have been asked by their electricity distributor to contribute to the upgrade of electricity supply infrastructure (eg. transmission poles and wires). Farms producing up to 5000 litres per day at peak of season (approx 180 cows), can easily meet their maximum power demand using a single phase or SWER power supply without using special equipment or procedures. Much larger dairies (up to 25,000 litres) successfully use single phase or SWER power supplies, by selecting and operating dairy equipment carefully. Upper Murray Development Board, PO Box 118, CORRYONG VIC 3707 Phone +61 (02) 6076 2136 Fax +61 (02) 6076 2180. For further information please contact Genesis Now or UMDB for further information.